Asian stock markets were up sharply after elections in Greece eased fears of global financial turmoil, but analysts warned that the economic crisis shaking the 17 nations that use the euro is far from over. Stock markets rejoiced at the narrow victory by Greek conservatives who favour upholding an austerity programme that their recession-mired country entered into in exchange for a financial bailout from international lenders. The results relaxed fears that Greece will stop using the euro and return to its old currency, the drachma, unleashing a host of disruptive financial consequences in Europe and beyond. If a party that opposes the bailout had won the election, financial analysts worried that stock markets would fall worldwide. Tokyo's benchmark Nikkei 225 index was up 1.9% at 8,729.47. Hong Kong's Hang Seng rose 1.6% to 19,532.16. Australia's S&P/ASX200 added 1.9% to 4,133.70 and South Korea's Kospi rose 2% at 1,895.55. On Wall Street, Dow Jones industrial average futures were up 40 points early on Monday, suggesting the market could open higher. The euro rose to 1.2703 US dollars from 1.2637 late on Friday. The dollar rose to 79.16 yen from 78.71 yen. The New Zealand and Australian dollars were also higher. Both currencies typically rise when investors have more appetite for risk. The Australian dollar was trading above 1.01 dollars and the New Zealand dollar was trading above 79 cents. On Sunday, pro-bailout parties in Greece won enough seats to form a coalition government. Greece has been dependent on rescue loans to operate since May 2010, after it was shut out of international markets following years of profligate spending and falsifying financial data. The country is mired in a fifth year of recession, with unemployment spiralling above 22% and tens of thousands of businesses shutting down. Greece had to agree to austerity measures to get its bailout. Measures included deep spending cuts on everything from healthcare to education and infrastructure as well as tax hikes and cuts in salaries and pensions. Anger at the measures has sent Greeks into the streets in frequent strikes and protests, some of them violent. 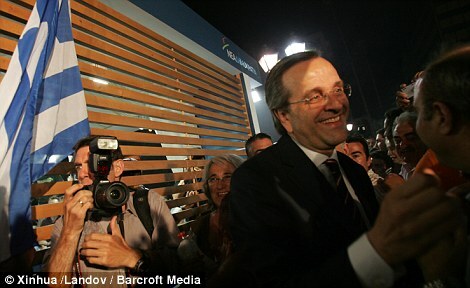 Some analysts said the election results could overstate the willingness of Greeks to embrace austerity. "Overall, the Greek election result, while welcome, does not imply that the Greek people are embracing the tough reforms tied to the bailout package. It merely meant that fear overruled anger," analysts at DBS Bank in Singapore wrote in a market commentary. David Cameron today called for Greece to move decisively and swiftly' to the formation of a new government, warning that 'delay could be deadly'. Mr Cameron was speaking at a G20 summit in Mexico which was dominated by the urgent need for a resolution to the crisis in the eurozone. The Prime Minister said that, by backing the centre-right New Democracy party in yesterday's elections, the Greek people had 'made their choice to stay in the euro' and should now form a government prepared to deliver on promises made in return for multibillion-euro bailouts. But he also called on the other eurozone countries - and particularly Germany and the European Central Bank - to take 'bold steps' towards the fiscal and banking union which he believes are necessary to solve the underlying problems with the single currency. 'The Greek people have now made their choice to stay in the euro, to accept the consequences of what that involves,' said Mr Cameron. 'Those parties that believe that need to get into government, need to deliver that. German Chancellor Angela Merkel's spokesman said she regards the Greek election results as 'good news for the euro, for the eurozone and for Europe'. But Ms Merkel indicated that she is not willing to countenance any relaxation in the demands placed on Athens for austerity measures in return for its bailout. 'The important thing is that the new government sticks with the commitments that have been made,' she told reporters at the summit in the Pacific resort of Los Cabos. 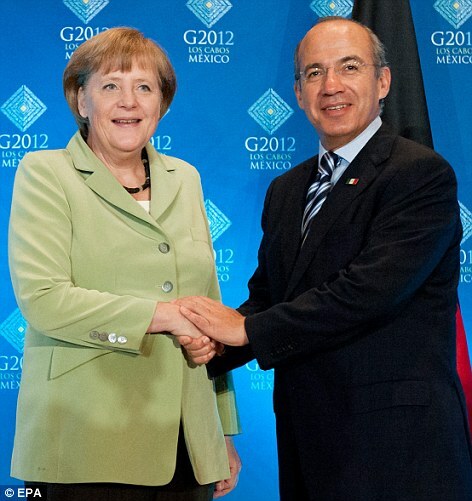 Germany is coming under intense pressure at Los Cabos to use its financial clout to underwrite a plan to stabilise the single currency. In a speech to a business audience ahead of the official opening of the G20, Mr Cameron said: 'The reality is that there are a set of things that eurozone countries need to do. And it's up to eurozone countries whether they are prepared to make the sacrifices these entail. 'The challenge is one of political will as much as economics. Of course these things are difficult to do, but just because these things are difficult does not mean we should not say them. 'If the eurozone is to stay together then it has to make at least some of these difficult decisions. Asked in a round of TV interviews whether he feared the eurozone crisis could drag on for years, Mr Cameron said: 'I very much hope that won't be the case. 'If eurozone countries act decisively, if they act clearly, if they deal not only with the short term financial pressures but also the longer-term underlying problems of the euro, if they take these steps, we can see this crisis ease. 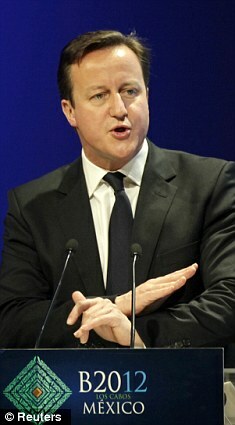 Mr Cameron cautioned against placing all the blame for the failure to make progress in the eurozone on Berlin. 'I can quite understand the concern that the Germans have,' he said. 'Their taxpayers have been asked to put a lot of money into Greece, they have done that and so they want the Greeks to stick to their side of the bargain. That's what the Germans are saying. Mr Cameron is expected to join Ms Merkel and eurozone leaders Mario Monti, of Italy, and Francois Hollande, of France, with US President Barack Obama later today to discuss the way forward for the single currency. New Zealand shares rose at the open, with mildly upbeat leads from Wall Street helping the exchange start on a positive footing. PGG Wrightson led gainers, while Chorus paced decliners. The NZX 50 Index rose 5.39 points, or 0.16 per cent, to 3461.07 in the first 30-minutes of trade. Within the index, 14 stocks rose, four fell, and 32 were unchanged. The New Zealand dollar recently traded at US79.19 cents, down from US79.34c at 5pm yesterday. On Wall Street, the Standard & Poor's 500 Index closed 0.14 per cent higher at 1344.78, with the last dregs of optimism from the Greek election outpacing fears on Spain and Italy in a choppy session. PGG Wrightson, the rural services company, rose 3.5 per cent 30c. The stock is rated as "hold" according to a Reuters poll of five analysts, with a median price of 44c. Guinness Peat Group, the financial services firm, rose 1.1 per cent to 47c. The stock is trading at a 40c discount to its net asset value, according to estimates from brokerage Forsyth Barr. New Zealand Oil & Gas, the energy exploration and production company, rose 0.8 per cent to 79c. Fletcher Building, whose chief executive Jonathan Ling announced he will be retiring at the end of September, rose 0.2 per cent to $6.31. Vital Healthcare Property Trust, the specialist investor in medical clinic real estate, fell 0.8 per cent to $1.25. Chorus, the network telephone company, fell 0.3 per cent to $3.09. Xero, the online accounting software maker, fell 0.4 per cent to $4.71 as investors continue to adjust their portfolios to reflect the company's entry into the NZX50 benchmark. Diligent Board Member Services, the governance software firm which also officially joined the benchmark yesterday, fell 0.3 per cent to $3.50.